Is there anything wrong with talking to your dead grandma, even if she talks back? In August 2012, we found out that sometimes the dead have something to say. Directing this 92 minute animation/adventure/comedy/family/fantasy is Chris Butler and Sam Fell. 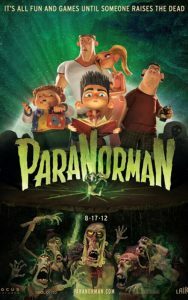 Giving their voices to the charaters is: Kodi Smit-McPhee as Norman Babcock, Tucker Albrizzi as Neil, Anna Kendrick as Courtney Babcock, Casey Affleck as Mitch, Christopher Mintz-Plasse as Alvin, Elaine Stritch as Grandma, Bernard Hill as The Judge, John Goodman as Mr. Prenderghast, Jodelle Ferland as Agie, Tempestt Bledsoe as Sheriff Hooper Leslie Mann as Sandra Babcock and Jeff Garlin as Perry Babcock. Norman is an unusual young boy; he still talks to his grandmother… who has passed away. Which works in his favor because a ghost is what warns him of a century old curse bestowed on the town by a witch. Now, it’s up to Norman and a handful of kids to try and save the town. Only problem, kids aren’t always believed by adults when being warned of certain doom. When the town of Blithe Hollow has a population boom, with a little help from the dead rising, the adults begin to see… something’s not quite right anymore. As the witche’s curse continues taking hold, time is running out for the citizens of Blithe Hollow. Suddenly, Norman finally realizes the truth behind the curse… Can he use his new found knowledge to save his home town in time? This was a cool flick, something the kids will enjoy. It has zombies, but nothing too scary in my opinion. The storyline is all about a kid finding the strength in himself to step up when he doesn’t think he can. Playthrough was good, and it has some good comedic value. I’m not a big fan of the animation, but it still looks good and moves smoothly. Here’s something for the kids that want a “scary” Halloween treat that is filled with witches, ghosts and zombies, but is not gory or really scary. Something that the parents will enjoy also. Summary : This one is worth the time to watch and the kids will get a kick out of it.